Excellent multivitamin. I notice a difference in my energy and overall well-being. Recommended by my naturopathic doctor. Very trusted brand. Has worked very well for me. 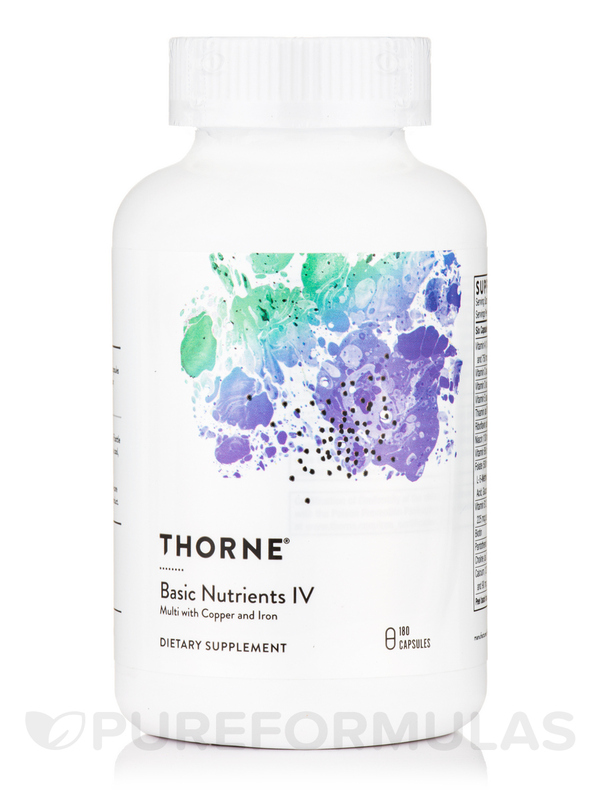 Basic Nutrients IV by Thorne Research is generally a great product with easy to swallow capsules. Basic Nutrients IV is a comprehensive multi formula. It is designed to support the active lifestyle of women who have not gone through menopause or anyone needing additional iron. A multi-vitamin/mineral supplement is more important than most people think. Because of the state of the current food supply and the difficulty of consuming five servings of vegetables and fruits daily‚ few individuals receive all the necessary nutrients from food. 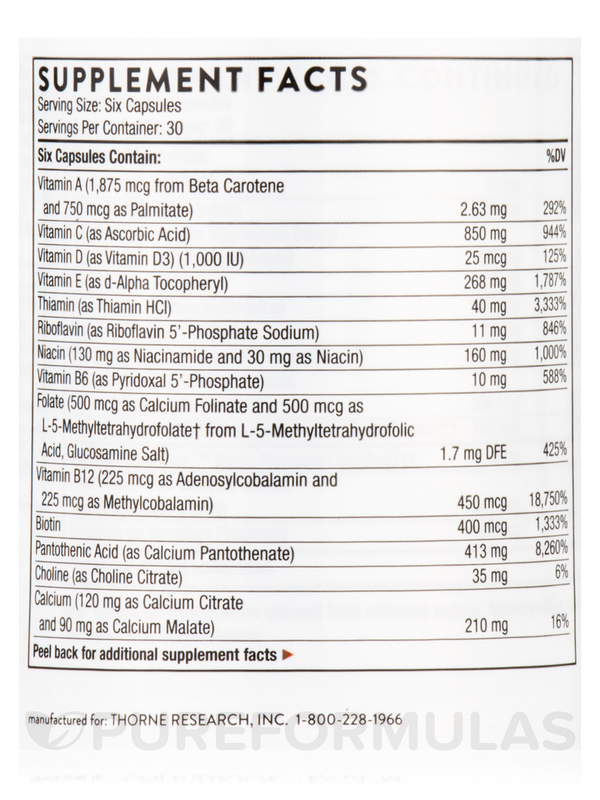 Basic Nutrients IV is a comprehensive multi-vitamin/mineral supplement that provides calcium‚ magnesium‚ and potassium as citrate and malate chelates‚ the active‚ readily usable forms of vitamins B2‚ B6‚ and B12‚ and tissue-ready folate as 5-MTHF for those who have methylation problems or poor conversion of folate to its active form. Basic Nutrients IV also features trace minerals exclusively available from Thorne as picolinates. A multi-vitamin/mineral supplement could be considered "dietary insurance‚" a small price to pay to be sure you get all the essential nutrients daily‚ even if you don't eat right. Even greater health benefits can be realized if you eat a healthy diet in addition to taking a multi. 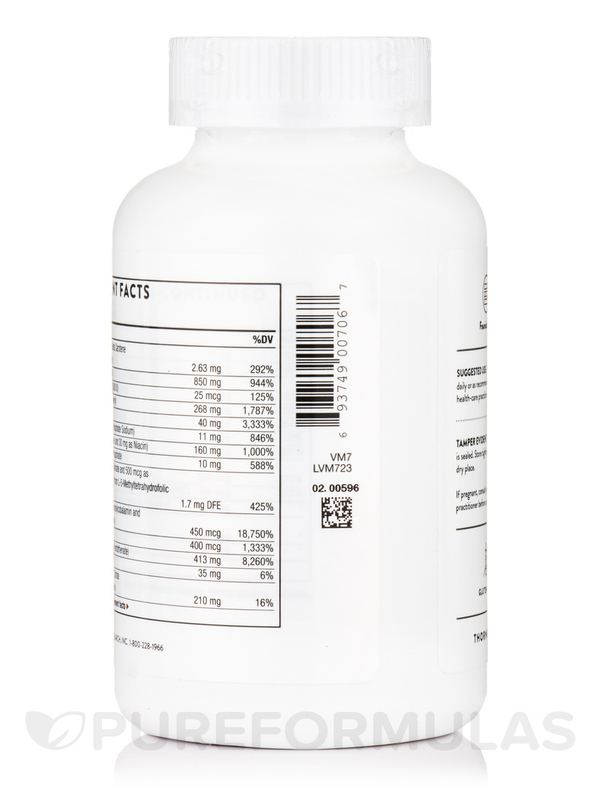 Basic Nutrients IV is a comprehensive multi-vitamin/mineral supplement that provides two key minerals – calcium and magnesium – as citrate and malate chelates. In addition to providing a well-absorbed chelate‚ citric acid has potential health benefits of its own. As an important Krebs Cycle intermediate – the body's internal process for producing energy – citric acid is essential for metabolism. Citric acid also inhibits precipitation of calcium oxalate and phosphate in the urine. 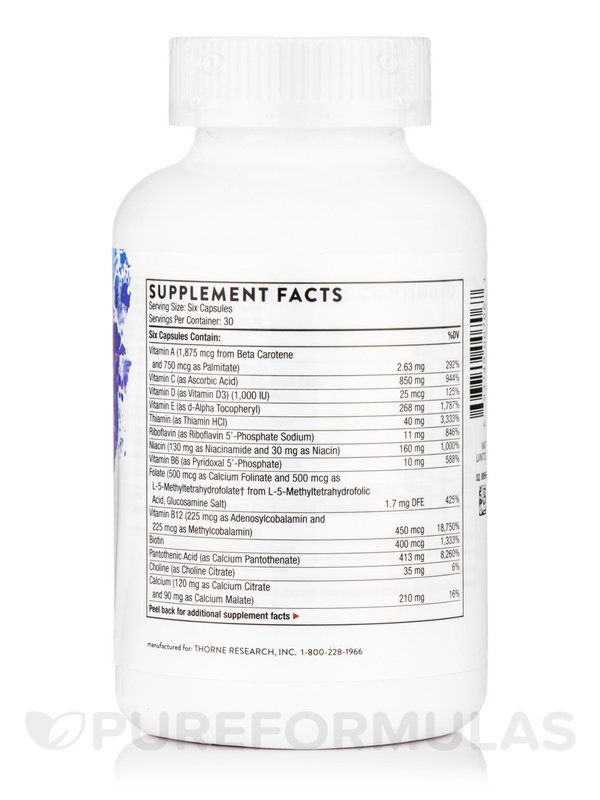 Basic Nutrients IV provides tissue-ready folate in the form of 5-MTHF for individuals with methylation issues or poor conversion of folate to its active form‚ as well as the active‚ tissue-ready forms of vitamins B2‚ B6‚ and B12. Chromium is provided as an optimally absorbed nicotinate glycinate chelate. Basic Nutrients III also features trace minerals exclusively available from Thorne as picolinates. Other Ingredients: Hypromellose (derived from cellulose) capsule‚ Microcrystalline Cellulose‚ Calcium Laurate‚ Silicon Dioxide. †This product uses Gnosis S.p.A.’s L-5-Methyltetrahydrofolic Acid‚ Glucosamine Salt (Quatrefolic®). Quatrefolic is a registered trademark of Gnosis S.p.A. ††This product uses Albion’s TRAACS® Chromium Nicotinate Glycinate chelate and Molybdenum Glycinate chelate. TRAACS is a registered trademark of Albion Laboratories International‚ Inc. †††This product uses Albion’s Bororganic™ Boron Glycinate Complex. Bororganic is a trademark of Albion International‚ Inc.
Folinic acid and 5-methyltetrahydrofolate supplementation is not recommended concurrent with methotrexate cancer therapy‚ as they can interfere with methotrexate's anti-neoplastic activity; however‚ these folate sources have not been shown to interfere with the anti-inflammatory activity of methotrexate. An individual taking methotrexate for psoriasis or rheumatoid arthritis can safely take a supplement containing folate. Vitamin C can cause diarrhea in some individuals in large doses‚ which can vary from person to person and resolves when the amount is reduced. 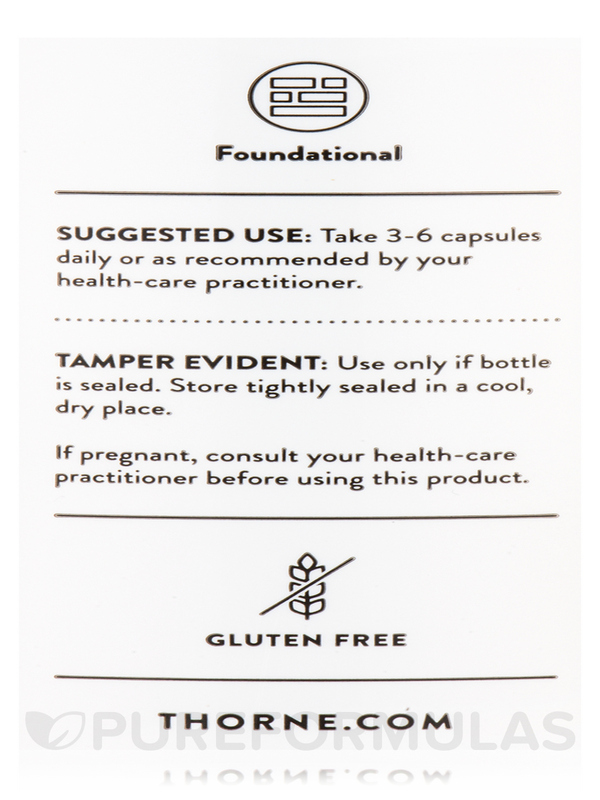 I've taken this Basic Nutrients IV with Copper and Iron (Citrate Formula) by Thorne Research supplement for 4 out of 4 pregnancies and nursing. Awesome quality and product. Makes me feel nauseous if I take on empty stomach or during the day. For this reason I take right before sleeping. I was referred to Basic Nutrients IV by Thorne Research by my doctor I really can tell the difference - overall, feel better and more energy. It is a little pricey but you get what you pay for. 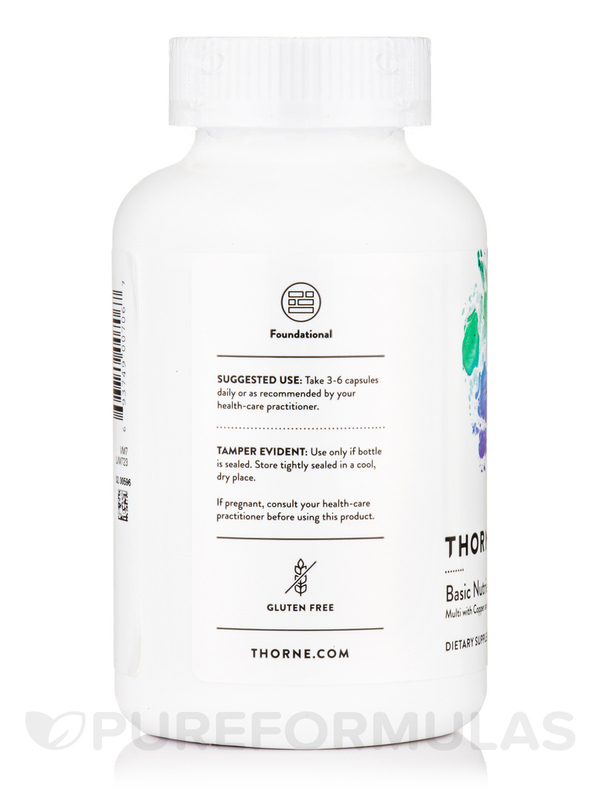 I ran out of my Basic Nutrients IV by Thorne Research and wondered why I was gradually feeling more and more tired and finally got sick. Never again will I delay ordering this excellent product. It is absorbable by the body and does not simply pass through as over the counter supplements. My chiropracter internist doctor recommended this product. With all the other supplements I am taking he recommended 4 a day and I am feeling better and better. I have been taking Basic Nutrients IV with Copper and Iron for several years. I am a busy mother of four and I feel that they keep me healthy and full of energy. Need to take 6 pills a day but its worth it. Ive been taking Basic Nutrients IV probably for 4 years and I feel good. It provides me with the amount of nutrients my body needs. I switched all my supplements because I learned I was reacting to Gluten. Those that do can also react to corn. Basic Nutrients IV with Copper and Iron is free of Gluten AND corn. Best Multi Vitamin hands down! We keep trying to save money by trying other multis BUT keep coming back to Thorne Basic Nutrients IV with Copper and Iron. We have learned our lesson no more experimenting for us. Thorne is #1. Nice energy all day long. Sleep like a log at night. BEST. You have got to try it! I love Basic Nutrients IV with Copper and Iron....it works great and my immune system is stronger for taking them. I like the way Basic Nutrients IV with Copper and Iron (Citrate Formula) has a good ratio of important vitamins and minerals.